Photo Above: Southampton HS at Sebonic Inlet, with teacher Jennifer Keller, looking through their seining finds. In the net are shrimp, killies, silversides, mussels and slipper snails. 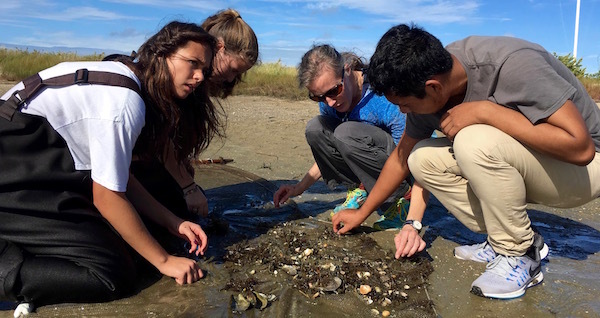 Nine hundred and twenty students from the third through twelfth grade spent last Friday, Oct. 21 engaged in hands-on citizen science exploration at 23 sites with the help of 30 natural history experts on the Peconic Estuary. “A Day in the Life of the Peconic Estuary” allows students to explore and collect firsthand information about the health of their river and estuary. This is the third year that students on the East End have participated in A Day in the Life of the Peconic Estuary, a project organized by Mel Morris of Brookhaven National Laboratory, with the help of the Peconic Estuary Program, the Central Pine Barrens Commission, the New York State Department of Environmental Conservation, Cornell Cooperative Extension of Suffolk County and environmental groups and science teachers throughout the East End. 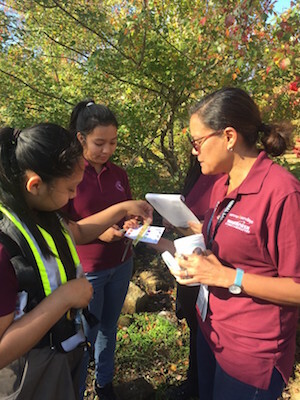 Students examined the physical and chemical aspects of each site, including salinity, the amount of sediments, nitrates, phosphates, and oxygen levels in the water and biodiversity inventories of the flora and fauna in and around the rivers and estuary. Their work will be available on the “A Day in the Life” website, www.portaltodiscovery.org/aday. Riverhead Charter School and their expert from Brookhaven National Lab monitoring dissolved oxygen levels on the Peconic River behind Roadhouse Pizza on West Main Street in Riverhead. Friday’s event took place on a surprisingly beautiful day. According to the organizers, freshwater sites were filled with a diversity of sport fish, including bass, chain pickerel, bluegill, pumpkinseed, and black crappie, and hundreds of macro invertebrates, especially large quantities of damselfly nymphs. The marine estuary sites were rich in biodiversity, with a variety of crabs, shrimp and bait fish, an indication of good water quality. The students reported that median water temperature was in the mid-sixties and water chemistry parameters are in the normal range.